"Our town is struggling already and this adds more hurt," said Councilwoman Melissa Schuster, who lost her home in the fire and is living with her husband in an RV on their property. 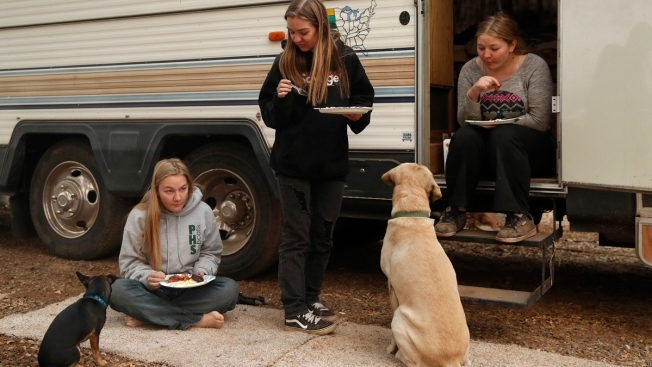 In this Nov. 14, 2018, file photo, sisters Arissa Harvey, from left, Araya Cipollini, and Arianne Harvey eat beside an RV they are living in near their home, which was was destroyed in the Camp Fire in Paradise, Calif. Some 100 Northern California residents living in recreational vehicles and other temporary shelters were ordered to leave their burned out properties after federal authorities threatened to withhold paying for the massive cleanup effort caused by the state's most destructive wildfire. Hundreds of Northern California wildfire victims desperate for housing and living in recreational vehicles on their burned-out lots were ordered off their properties Monday after federal authorities threatened to cut off funding for the state's biggest natural disaster cleanup. "I'm asking you not to throw the people of this town into the cold in the middle of winter," Paradise resident Ben Walker told the city council. "If the option is to choose federal money to rebuild the town, or the people to rebuild the town — choose the people." Butte County supervisors took the same action later in the day, ordering dozens of residents living in temporary shelters to leave their properties until they're cleared of fire debris. David Samaniego, the FEMA official in charge of the agency's wildfire response, told local authorities on Jan. 24 that allowing the RVs into Paradise jeopardized public health and safety. In November, Butte County Health Officer Dr. Andy Miller warned residents that fire debris is hazardous and advised them to stay away from their properties until cleared. "Butte County and Paradise allowing its residents to re-occupy their property prior to fire debris and hazardous materials being removed from their property is in contrast to Dr. Miller's warning," Samaniego wrote on Jan. 24, warning state and local officials that federal cleanup funding was in jeopardy. Schuster said the city council passed the ordinance in December allowing residents to live in RVs out of desperation. Thousands of residents remain without long-term temporary housing while the region tries to rebuild. Schuster and her husband purchased an RV after the ordinance passed and moved out of their daughter's house and into the RV on their Paradise property. Schuster said she hired a contractor to clear her debris rather than waiting for government-supported crews to get to her property. She said her property is mostly cleared and she and her husband are awaiting inspection and certification, so she's hopeful they won't have to leave. A flurry of activity greets you as you drive around Santa Rosa’s Coffey Park neighborhood. 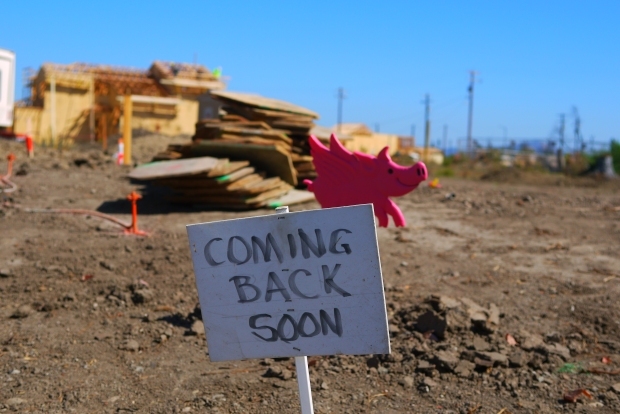 A year after deadly wildfires burned down the place, the neighborhood continues to rebuild. These photos and videos show the aftermath of the deadly wildfires and what some of the streets look like now. Schuster and other Paradise officials said they don't know how the change back to the old rules will be enforced, but said authorities are trying to schedule crews to clear those properties as soon as possible. It takes about two days to clear debris from a lot but up two weeks to complete an inspection and certify the property safe, Schuster said.